In a highly competitive and constantly evolving digital environment, it is important for a business to keep pace and adapt accordingly. Most people these days use a variety of devices to access the internet. The screen size and user interface varies on every device which often makes websites seem incoherent. SEO (Search Engine Optimization) campaigns can help drive more traffic to your website but if your website is not responsive to different screen sizes, your turnover rate would suffer. Therefore, it is imperative that you empower your business with a responsive website. Some of the major benefits of a responsive website are stated below. The greatest advantage of a responsive website is the exponential increase in readership. As most people access the internet using their smartphones, a responsive website which fits all types of screens would help you garner a larger audience. 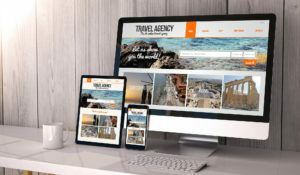 Regardless of how good of content there is on your website or how attractive the web design is, a non-responsive website won’t be able to attract a significant portion of your target audience. Flexibility and adjustability are pivotal aspects to the success attracting more traffic to your website. By making sure that your website is responsive, you can achieve your marketing goals and reach more people than ever. While you might be able to get a considerable amount of page hits on your website, your turnover rate will suffer if your website is non-responsive. The amount of traffic reaching your website will not transform into sales or leads until everyone who visits your website is able to view it in a coherent manner. Only a responsive website which provides optimized readability and viewing across different screens can help you turn page hits into sales. Google does not only take into account relevant keywords to rank your website in search results. But it also reviews other factors such as how accessible and easy to read your website is. Therefore, one of the major benefits of a responsive website is that it can help you improve your website’s SEO ranking. If you wish to find out more about the benefits of a responsive website or have any other queries regarding digital marketing, contact FORWARD marketing at (773) 227-3269 to speak with a digital marketing specialist.